We offer the easiest way to create mobile applications for your business. Each application is custom made by our team of engineers as per your business needs. 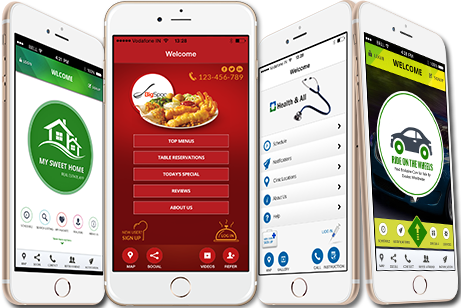 Apps for Company strives to build exceptional customer relationship management apps for start-ups and enterprise clients across iPhone, iPad, Android, and the web. We develop fully-featured customer relationship management tool that helps you to keep in touch with your client base and also help increasing your existing client base. The patients can book appointments with their doctors through their phones and receive confirmation of their bookings. The application helps with client retention - deals are sent to the patients through push notification and patients have the option to communicate with Casa De Salud staff. We use easy content management system that allows us to create beautiful apps in no time. From strategy to design to app development, Apps for Company helps you customizeevery step of the way. Our app marketing team will help you explore the variety of solutions to monetize your ideas. We use secured servers and the latest hosting technology that allows you to manageyour app from one simple control panel. We offer the most cost-effective app solution that provides you with a huge return ofinvestment. We’ll help you find the most creative app ideas to deliver short but long term value toyour business. Select the plans that is suitable for the current stage of your business needs. Enter few details about the application. We understand how time is precious and as such we only ask for few necessary fields for our team of engineers to create the application. We will send you the completed application and once approved, our team will upload the same to Itunes and Google Play Store.